Unfortunately I can no longer make one of the shows I booked tickets for so you have the chance to go in place of me - care of ebay. Bids have already started for a central FRONT ROW seat at Croydon Fairfield Hall on Wednesday 22nd October 2003. Click on the photo to find out more. 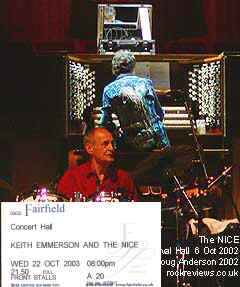 Promoters www.cclive.co.uk offer you the chance to win an opportunity to meet Keith Emerson & The Nice at a Sound Check here. Good luck. For visitors unfamiliar with The Nice I've added links to some sound files from the official albums below. Nice guitarist Dave Kilminster has a new official website. You can read reviews of the 2002 shows here. At the launch show for Keith Emerson's 'Emerson Plays Emerson' piano album last April (review) Lee Jackson (bass and vocals) and Brian Davison (drums) joined Keith onstage for three instrumentals. In addition Keith read a tale from his forthcoming biography 'Pictures of an Exhibitionist' which is now available to pre order from Amazon (Hardcover - Blake Publishing Ltd - 14 July, 2003) Amazon price: £11.89) . If you do pre order please use the link to the right and search under books for +"Keith Emerson" +"Pictures of an Exhibitionist". 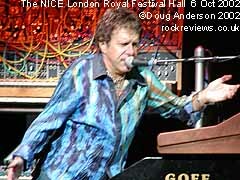 Starting March 15, 2003 Keith Emerson began hosting the half-hour weekly radio show 'EMO's Memo's'. The show os available on Total Rock, Sky Digital Channel 885 and NTL Channel 874 from 9pm UK time. During the show Keith talks and plays records that have inspired him throughout his career. 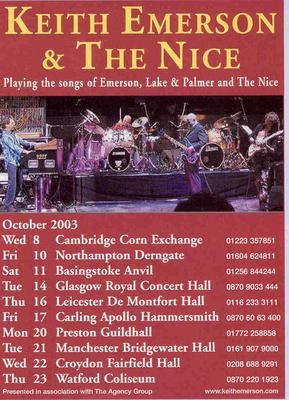 Later in 2002 the band played four dates around the UK (see below for links to reviews) which were recorded and will provide the source for a live album later this year. Now a longer tour is planned and once again the dates are available below. So far only UK dates are confirmed though other European countries (and further afield) are in the planning stage. One or two changes have been made since I first published the details in late Feb and there is always the chance the same may happen to those not yet onsale. 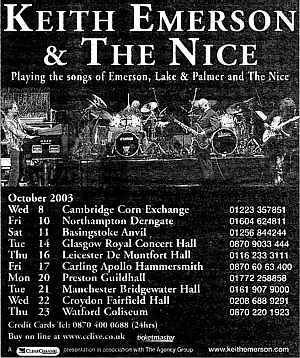 Further changes have been made (as of 8 Apr) to the Emerson/Nice tour with the publication of the advert to the left in the Guardian newspaper (and possibly others) on Friday 28 March 2003. I've updated the list below with the details but for any shows not already on sale please be aware that they could change date or be dropped from the list. Interesting choice of picture they've used too! Despite listing the url on the advert even a week on there is no mention of the tour, nor the fact that there was one last year, on the Keith Emerson site. 24 Apr 2003: Obviously plans are still being made as a new date has appeared - a return to the Newcastle Opera House on Wednesday 15th October 2003. (News care of Gary Hurley). Dianne has pointed out that though the venue itself have no mention of the show and it isn't listed in the press adverts Ticketmaster have seats onsale for the Philharmonic Hall. The current issue of Time Out (fortnightly London listing magazine) features an advert for the Hammersmith show while the May 2003 issue has a colour version of the above advert (albeit with a lightly different design and more obvious head) still listing an incomplete set of dates. (Scan care of David Bentley). Again, despite the adverts pointing surfers to the Keith Emerson site there is no mention of the Nice, a tour or the forthcoming live album there. For the moment Rock Reviews seems to be the most up to date site for information on the tour thanks to our network of fans. Tickets began going on sale in early March though at least two of the venues stated final contracts have not been signed and tickets may not be available for a couple of months. Sign up to my site update list for updates to be emailed to you. Thanks to Andy Wilson and Martyn Fenwick for on sale dates. 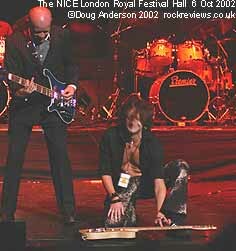 In addition to Keith, Lee and Brian a guitarist in the form of Dave Kilminster (of Qango, John Wetton Band and Ken Hensley Band) replaced original guitarist Davy O'List. Also joining the band for some non-ELP tracks are Phil Williams (bass) and Pete Riley (drums) . 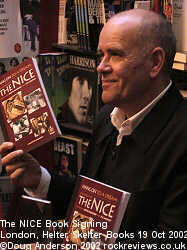 "Hang on to a Dream", a biography about The Nice by Martyn Hanson was released at the official launch (review) on 19 October 2002 at Helter Skelter Bookshop in central London. Lee and Martyn were present to sign copies, Brian being too ill to attend (though he did phone Lee during the event) while Keith was out of the country. To the right you can see Lee proudly displaying the book. The book is available to order from Amazon for £11.19 and Helter Skelter advertise their price as £13.99. More details on the 2002 news page. You can find music clips via the Amazon Nice page for tracks from the CDs listed below. (these links duplicate those on the Amazon site). If you want to buy copies then please follow the Amazon link to the right and you will help in a small way to keep this site active. You can read reviews of the albums plus ELP ones at http://www.warr.org/nice.html. This page is Copyright © Doug Anderson 2000 - 2003. Created: 15 August, 2002. Last updated: 7 October, 2003.